"Dr. Humes said that no major blood vessels were struck by the bullet passing through the President's neck." -Pierre Finck. Thanks Adam... 1st) the two wounds did not connect and 2nd) the bullt RISES from back to front.... you're not really suggesting it's possible.. But i do not believe the bullet that struck the president in the back went on to hit Gov. Connally. 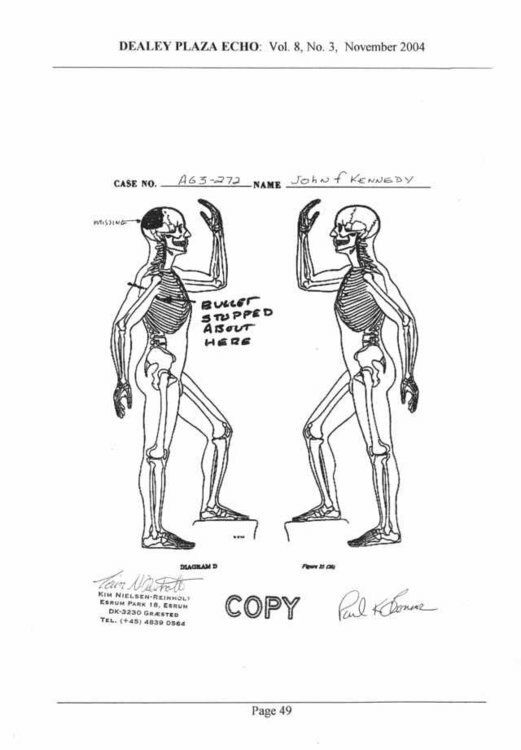 This is according to Paul O'Connor... the testimony from KNUDSEN suggests the same thing as he talked about the probes thru the body from both back and front. Mr. Purdy. 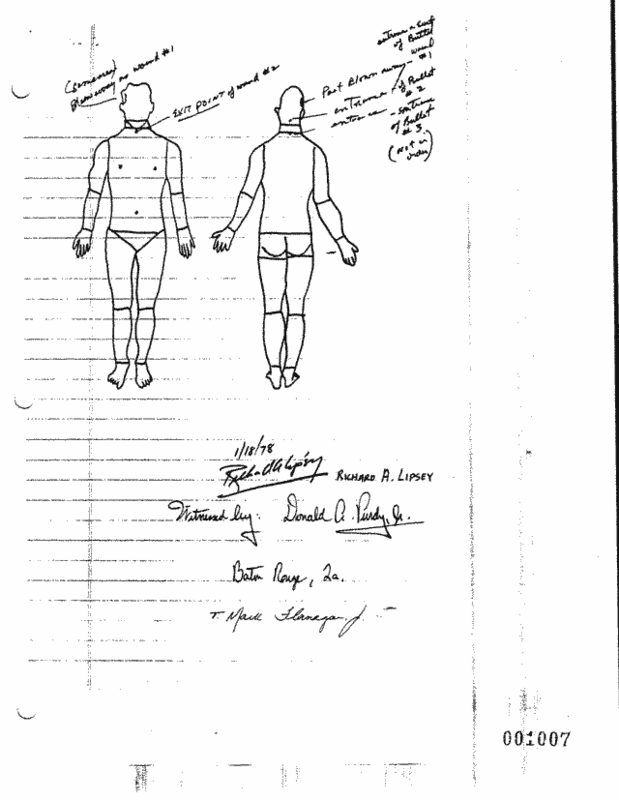 Where did the probes go through the body? Mr. Knudsen. From the point where the projectile entered to the point where the projectile left. Mr. Purdy. Where were those two points? Mr. Purdy. Was there one probe that you saw through the body, or were there more than one? Mr. Knudsen. More than one. Mr. Knudsen. Right about where the neck-tie is. That would be somewhere in that vicinity. Mr. Purdy. Approximately how much lower than that would you say the other probe, which went through the chest cavity? Mr. Knudsen. I would put it six, seven inches. Mr. Purdy. The probe that you said you could see coming out of the neck, the front of the neck, where was it out of the back of the neck? How high up would you say that one was. Mr. Knudsen. About the base of the neck. "Part blown away - would #1"
After the assassination, Lipsey said that he and Wehle met the body at Andrews Air Force Base and placed it in a hearst-to be transported to Bethesda Naval Hospital. 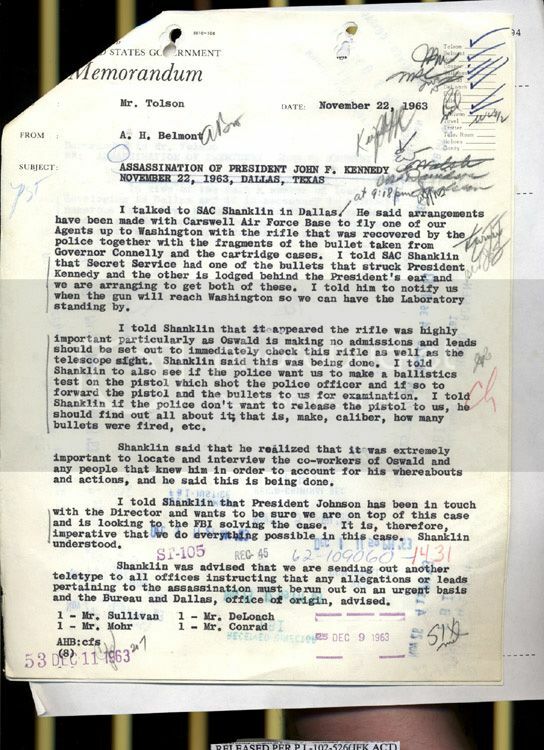 Lipsey mentioned that he and Wehle then flew by helicopter to Bethesda and took JFK into the back of Bethesda. A decoy hearst had been driven to the front. After bringing the body into Bethesda, Lipsey said that Jackie Kennedy and the family entered the front of Bethesda and travelled to the "Presidential suite." Who has written the page in blue ink above.....Is this Paul O Conners notes on who was in the autopsy room at various stages on Nov 22nd and 23rd 1963? The actual throat wound height off the ground would have been 41.905" - 1.485 (2.665 - 1.18) = 40.42"
Frazier documented the windshield damage at 14.5" below the windshield top. 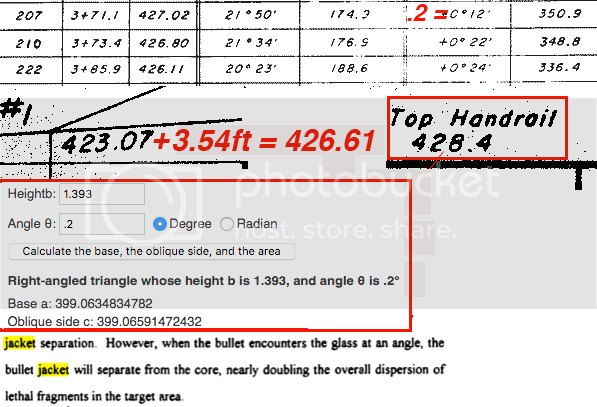 The limo roof was 57"
57" - 14.5" = 42.5"
Windshield damage was approx 42.5" - 40.42"= 2.08" above the throat wound = a slight downward trajectory from approx 315ft 399ft away. Shooter on the TSBD 6th floor west end say hello to your friend in the carpark upon the south knoll. The 315ft measurement was down to the sidewalk. Sorry about that. 133yds to the top of the south knoll. Elevation 426 + 1.39 = 427.39 = shooter rifle barrel elevation, pulling trigger at approx z207. Barrel is approx 1 foot lower than the Overpass handrail. Bullet hits windshield, fragments, slows down to approx (741 x .724 ft per sec) 536ft per sec, deviates downward 2.08inches and strikes JFK's throat. Your work on this is amazing and very much appreciated. 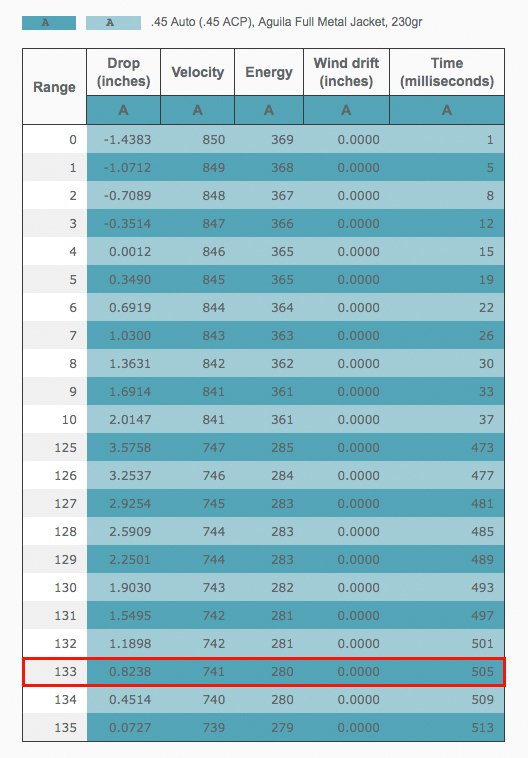 I have a challenge for you, I really hope if you get the chance you can look at the following for me and break down the measurements in distance and elevations from street level(most of which i believe you have probably already calculated)......just need to formulate my request into a logical understandable form. 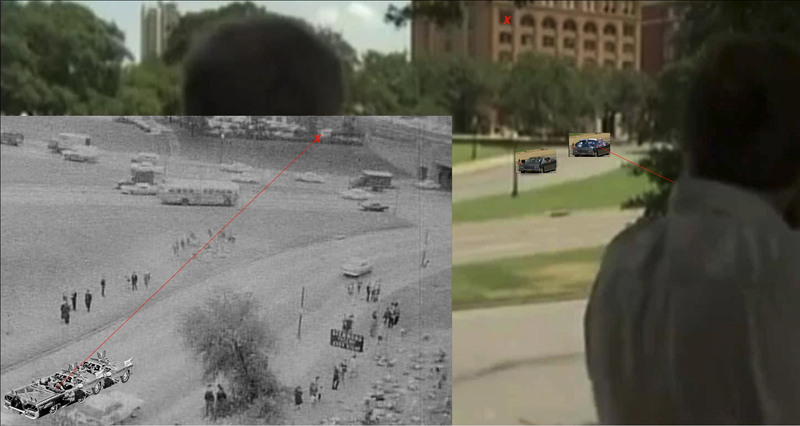 OK here we go..
Chris what i would like to achieve here is a list of measurements that if someone was to go to Dealey Plaza today and anchor a spot on the ground directly below the mid point of the 6th floor snipers window at street level. Then using this as our axis point run a tape measure so they could stand at the exact location on Elm Street and at the height you calculate, place a stand/tripod(for lack of a better word or implement name) at the height of JFK's throat wound(back wound point is under to much conjecture). 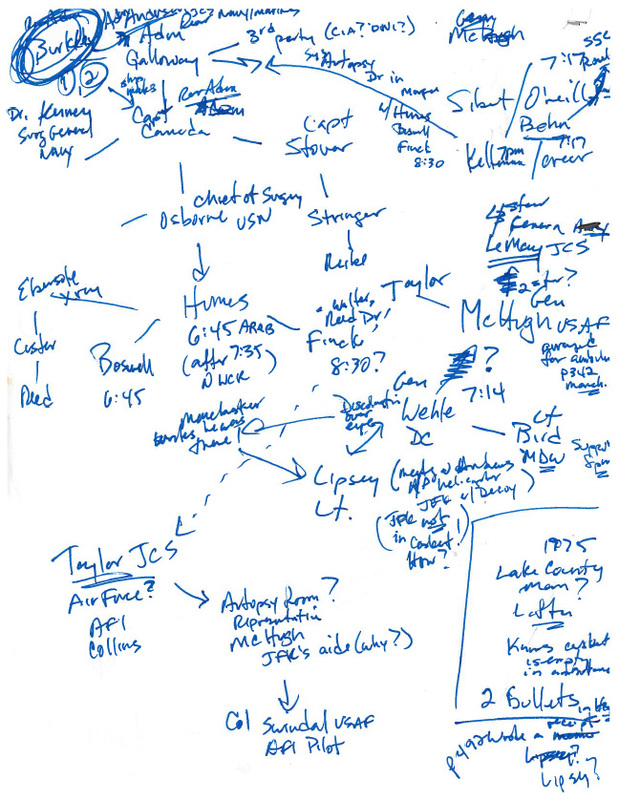 I guess what I'm trying to achieve here is a kind of "follow the bouncing ball" where the ball is actually JFK's throat wound and the bouncing is its movement down Elm Street. The distance or section of the drive down Elm St I am interested in is from Z207 to Z226 I would like to plot each of these points in distance and height then later this year i hope to be in Dallas to conduct an experiment to see just where a laser pointer would strike on the surrounding buildings if placed facing backwards at specific angles (which i will be calculating from the photos of JFK's clothing). Basically i will be constructing a plastic housing that for want of a better description would look like like a cheer leaders bull horn only it would fit in the palm of your hand (roughly the size of a pen)....it will represent the size of a 6.35mm diameter exit hole on one end and then a slightly larger perhaps 10.5mm diameter opposite end thru which the laser pointer will be shone thru. The side walls of the tube helping to narrow the range finding of the beam. A 32-year-old male reported to the casualty of our centre, approximately 2 hours after sustaining a single gunshot wound to the left posterior cervical region of the neck. His chief complaint was neck pain. No neurological deficit was noted on examination. He was conscious. Sensory examination was intact for pin xxxxx and light touch throughout, and the vital signs were within normal limits. 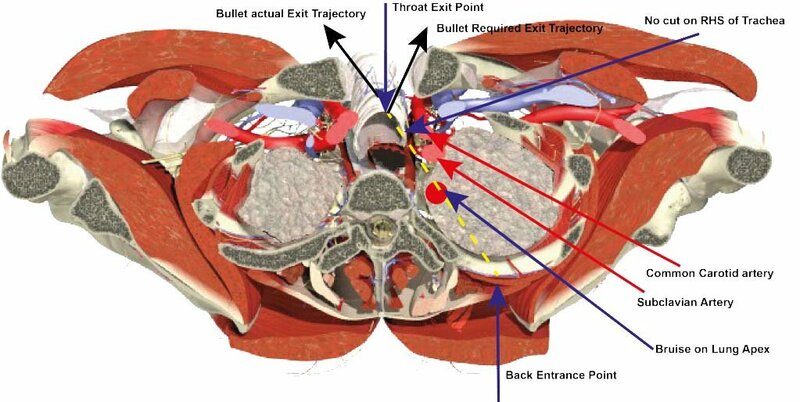 The bullet entrance wound was in the left posterior cervical region of the neck, above and medial to the scapula. No possible exit wound for the bullet could be identified anywhere else on the head and neck region. The patient had not seen the assailant as it was night time and the bullet had been fired from behind his back. Because of the same reason, neither the type of weapon used to fire the bullet, nor the distance between the weapon and the patient was known and could not be judged. Both carotid pulses were palpable, and there were no carotid bruits. Initial radiographic (Figs. 1, ,2)2) and CT scan (Figs. 3, ,4)4) studies showed a bullet fragment in the left side of the neck at the levels of C6 and C7. It appeared to be a civilian gunshot injury. Taking into consideration the 10.2ft distanced traveled from pull of trigger, the limo drop in elevation = 10.2ft/18.3ft = .557 x 12 inches = 6.68 inch drop. This lead is reflected in CE560 documentation. The problem is, it's supposed to represent a shot from the 6th floor snipers nest with a car traveling at 28+ mph(see CE884 Orange Version z207-z208). In essence, it sounds like you are trying to recreate/exact CE884 (There are two versions). It is the method that was used originally (on the ground), although once they got their initial starting point (say Z161), I believe they just measured to the next succeeding entry. I do have a brief video of this method starting from Position A to Z161. Will post later if interested. Thanks for the reply....Do you agree with any of the following measurements?????? Using the extant Z film and landmarks (Z206.5-z230.5) within, along with the WC (dots = frames) on the survey plat. I believe you're referring to the hypotenuse measurement from the rifle barrel on these next four to 3.27ft above street level. 3.27ft = bullet mark in JFK's back measured from street level up. Have you ever done any comparisons with the yellow curb painted sections on Elm St visible at Z207, Z300, Z358, Z385 or Z435? The range of z210-z222 (12.5ft/12frames = 1.041ft per frame) on CE884 is a little more concentrated than what is possible to measure in terms of stationary landmarks.